Most of what happened in December related to our Christmas fiasco festivities, which I detailed earlier this week in Laugh So You Don’t Cry: What It’s Really Like to Celebrate Christmas With Little Kids. Other than that whole situation, I can report that it is still winter on the homestead. We’re still covered in snow, although not as much as in November. It’s white and fluffy. Except for the spots where it’s icy and thin. And the spots where it’s both thick and icy. Also, it is cold. Mr. Frugalwoods continued his valiant, year-round efforts to maintain our hiking/snowshoeing trails. Trees keep falling across them (rude) and so he keeps heading into the woods with his chainsaw to clear paths. The ability to hike on our land is one of the reasons we bought so much of it and so Mr. FW’s put in a lot of labor to build, extend, enhance, and maintain our trail system. 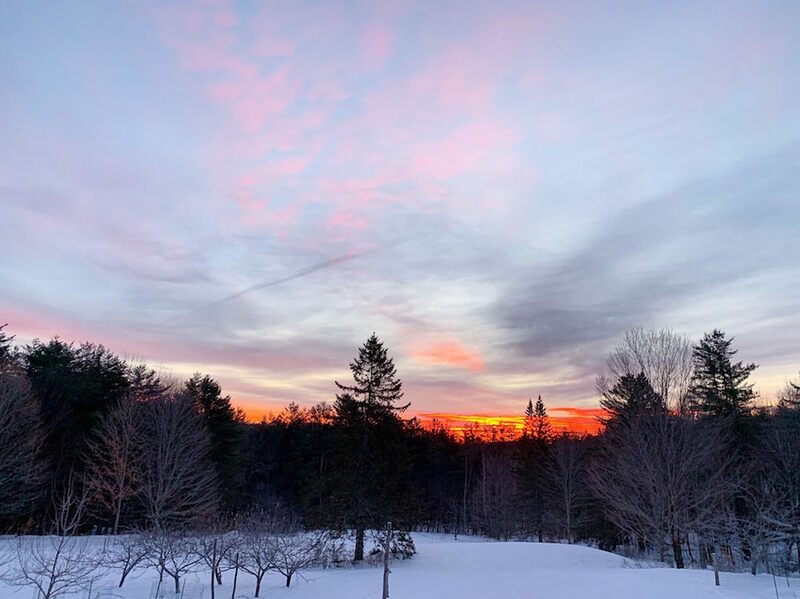 We’re experiencing frequent blow downs this winter (technical term for when a tree falls over), due in part to excessive quantities of wet, heavy snow. 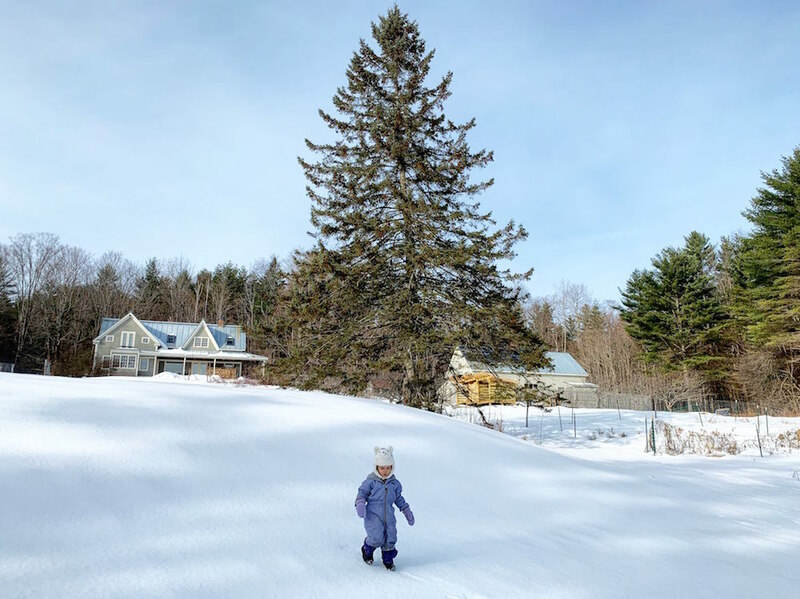 Enough wet, heavy snow draped over branches–particularly of a tree that’s already past its prime or diseased or compromised in some other way–will topple it over. And, it seems, more often than not, right across our hiking trails. 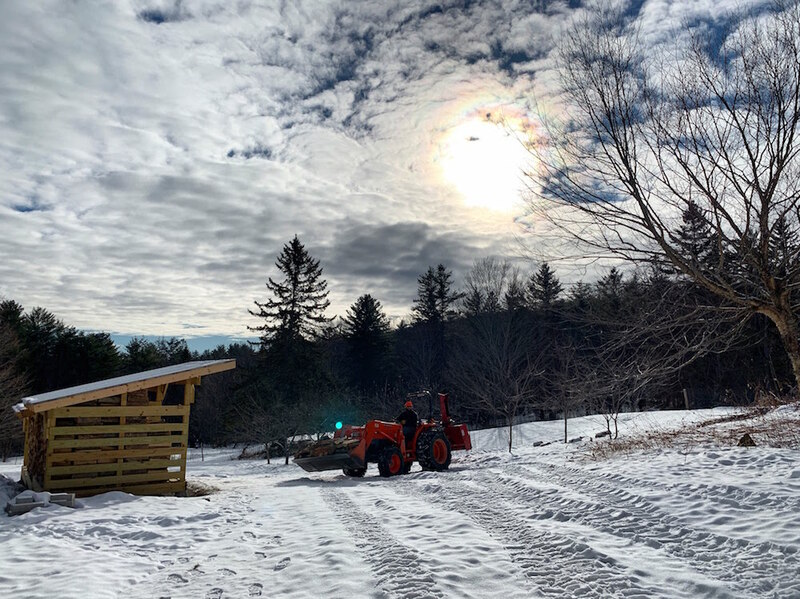 No worries as Mr. FW reports he is “getting better at running a chainsaw on snowshoes.” If you’d like to read more about Mr. FW’s trail clearing and building endeavors, check out: This Month On The Homestead: Trail Building 101 And A Second Birthday Party. And a note that Mr. FW takes chainsaw safety very seriously and always wears chainsaw protective chaps, boots, gloves, helmet, ear protection, and a face shield. Don’t mess around with a ‘saw! Ok actually toddler snowshoes, but “baby snowshoes” conjures a more ridiculous image. We bought Kidwoods (who is three years old) a pair of mini snowshoes for $1 at a garage sale last summer and we broke them out last month! 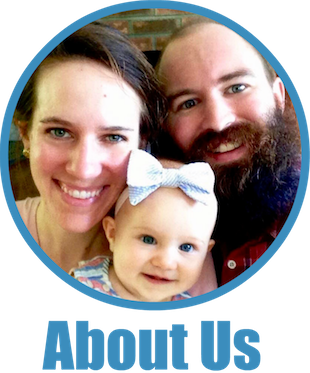 Though hesitant at first–she is not a daring person–she warmed up to the idea when she realized it was going to be a Kidwoods/Daddywoods trip (minus mama and baby sister). The two of them snowshoe clomped around and around the house and barn and I think she really got the hang of it! 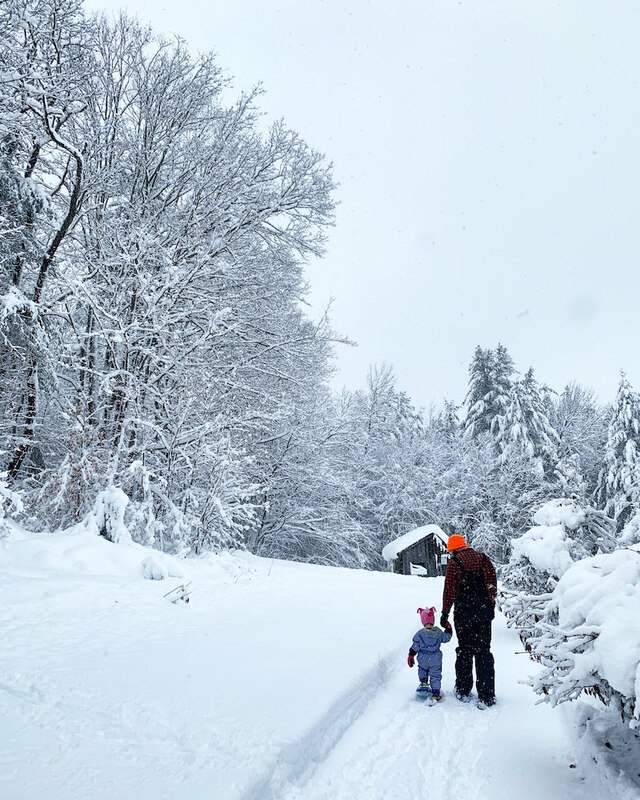 Mr. FW and I love snowshoeing and so the sooner we can get our kids on the trail with us (and out of the baby carrier or pull-behind sled), the better! Littlewoods, for her part, is still working on standing up, so I think snowshoes are a few years off for her. I should start a blog dedicated solely to the life and times of our wood. So many adventures, so many re-locations, so much permutation is the life of our firewood. We also seem to be in a constant state of wood flux. Since we heat our home with our woodstove, wood is always in our house, near our house, and around our house. It’s everywhere. I had no idea how apt the “woods” part of my name would become. Due to our intense, frigid winter (and it’s only December!!! ), we’re devouring our firewood stash. Fortunately, Mr. FW has several years’ worth of firewood harvested, split, and stacked in the woodshed (more like wood palace) he built this summer. Without that buffer, we very well might’ve run out of wood this year. Since moving here, we’ve typically burned just three cords of wood per winter (wondering what a cord is? Check this out). This year, however, we’d burned an entire cord by mid-December. That does not bode well. Seeing as winter doesn’t end until June April, we’re on track to surpass our previous three cord metric. In mid-December, Mr. FW moved one cord of wood from the woodshed up to the porch. The porch wood rack he built a few years ago holds 1.5 cords stacked in three rows (each row holds 1/2 a cord). We’d used two of those rows and so it was time to re-stock the stash. Mr. FW likes to refill our porch wood rack when weather conditions are amenable/convenient for the task (i.e. not in the middle of a blizzard). He picked a day where we didn’t have a lot of snow on ground (that’s a relative appraisal), which is ideal since he uses the tractor for this task. Thanks to the new front chains on the tractor, he reports the refill was much easier than in years past. In order to position the tractor bucket towards the house, he has to make an uphill turn and this didn’t go too well without chains: the front tires slid on the hill as opposed to turning. Sub-optimal. The chains, however, made this maneuver super easy. Counterintuitively, the chains also saved our grass. Last year, the tractor decimated swaths of grass during wood rack refills (on account of all the tire slipping), but with the chains? Nary a scratch to the old sod. Mr. FW and I remark often that it’s a good thing we’re not sod farmers because our grass is atrocious. You expect me to say that our child(ren) went sledding. And yes, I did coax Kidwoods down the hill in the sled with me once. But she was much more interested in scooting down hills on her rump because that way she could control her speed. And also stop to snack on snow anytime she passed a delectable snow patch (which, apparently, we have a lot of in our yard). Indeed, the kids were not the ones who loved sledding this month. Mr. FW and I sledded down our hill together. Not with either kid, just the two of us. I was outside with Kidwoods and he was outside stacking wood. We looked at each other across the expanse of our yard, I waved at the sled, he gave a thumbs up, and jogged over to me. We hopped in the sled together and sailed down the hill. Just once. That’s all we had time for. But it was a perfect moment of connection. A mini date. A reminder of what we used to be like before we had children and a homestead and endless responsibilities. As we glide* towards 11 years of marriage, we still love sledding down a hill together. *I initially had “barrel.” Then I tried “stagger,” “careen,” and “tumble.” You can see why I landed on glide. Intentional burning! We were the not-so-proud owners of a self-generated monstrous pile of brush. Located in the field below our house, this brush pile contained the results of a spring and summer’s worth of pruning and cutting. 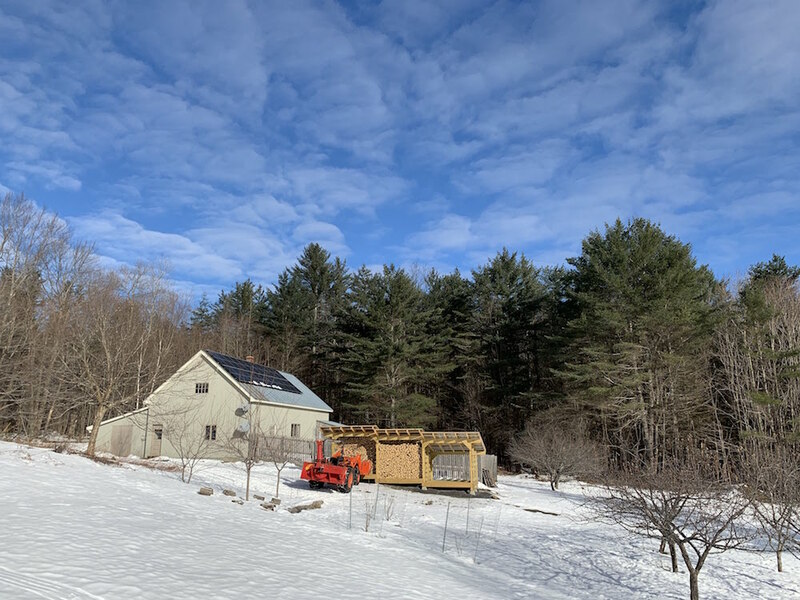 Included were the tops of trees Mr. FW’d cut from the edge of our field to allow more sunlight to reach our vegetable gardens and apple trees along with miscellaneous yard detritus too small to be firewood, but too large to be compost. The pile–which was oval shaped–measured 6 feet tall, about 14 feet long, and 5 feet wide. The day after a warm, sunny day, which meant that the snow had mostly melted off the brush pile, but there remained plenty of snow around the brush pile, creating a buffer to reduce our chances of setting our yard on fire. The pile had been sitting out there for almost a year, so it was reasonably dry and ready to burn. Optimal safety conditions! Mr. FW used our famous flame weeder to torch the pile. He reports that he, “turned it [aforementioned flame weeder] on full blast and pointed it towards the middle of the pile.” He tended the fire as it burned and used the tractor bucket to periodically push the edges of the bonfire towards the middle to ensure everything burned wholly. True to predictions, it rained the next day, which extinguished the remaining embers. We were surprised at how quickly the pile burned down and, given its speed, I didn’t get any photos. I planned to run out during the girls’ afternoon naps to capture some hot fire action, but it was almost completely burned down by 2pm. Plus I really wanted to eat a snack instead, so I opted to forgo the sojourn. Solar panels nice and un-snow-covered! 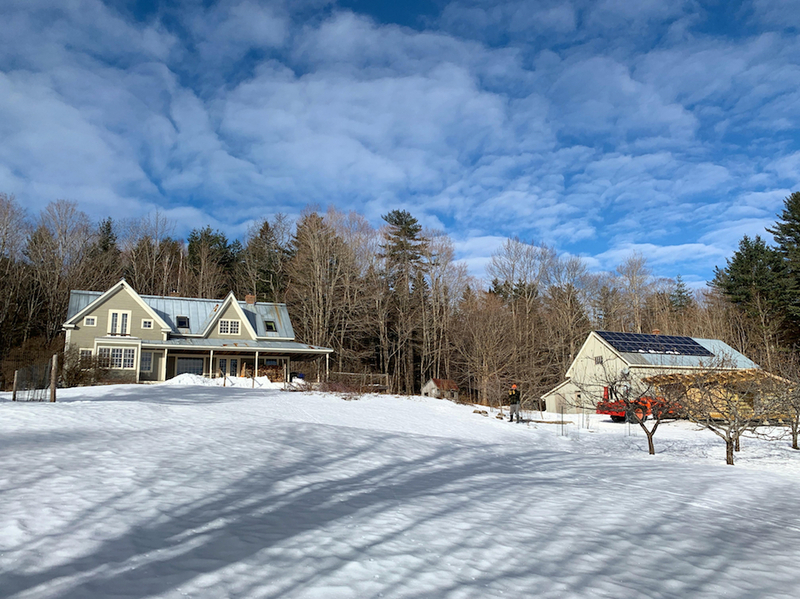 In December we generated 271 kWh, which is a lot more than in November for the simple fact that we had a lot less snow covering the panels in December. While I only document homestead life once a month here on the blog, I post photos to Instagram (almost every day!) and updates to Facebook with much greater regularity. Join me there if you want more of our frugal woods. Some folks have asked about this and yes, I do try to post a picture to Instagram every day and–unlike with many other things in my life–I actually have a pretty good track record. If you’re craving more homestead pics, Instagram is your best bet. 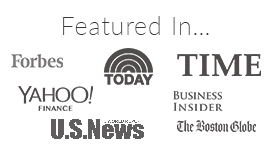 And if you want to make sure you don’t miss a post here, sign-up for my handy dandy email list in the box below. You’ll get a message from me if you do… On to January, frugal comrades! Hilarious writing and fantastic fotos as always! Kudos to Mr. FW for staying on top of all of the trail-clearing. Our small, 10-acre family-owned woods here in Michigan has a relatively high water table and is full of large stands of standing ash which was killed some years ago by an ash-borer infestation. The combination results in frequent blowdowns which require the same chainsaw treatment in order to keep trails to stands and food plots navigable. Sometimes it feels like an exercise in futility, although it does make the annual woodcutting efforts slightly easier, as no standing trees ever have to be felled! I wish more people put as much forethought and planning into creating such a solid plan for brush burning as you have. I’ll never forget the small briar-patch burning that my Dad attempted when I was but a young tyke. Suffice it to say there was no adequate snow cover, burn permit, or lack of wind involved. As one would expect, it ended rather badly by spreading to the remaining stubble in a neighbor’s cut corn field. The ensuing family fire-fighting and bucket brigade formed a lasting impression on the importance of handling fire with caution. Mrs. FFP gave birth to our second child just 10 days ago, making the spread between our first and second official at 20.5 months. Let’s just say I found your asterisked footnote on your marriage milestone comment to be both quite apt and comical! It’s always good to know you’re not alone. Happy New Year! Sounds like winter is off to a stellar start! I hope that your January frigid temps don’t last too long and that you guys survive the snowmageddon that is heading your way this weekend! I’m kinda missing the snow this year down in NC (a little bit? maybe?). Three cords+ a season… wow that’s wild. What stunning winter landscapes! 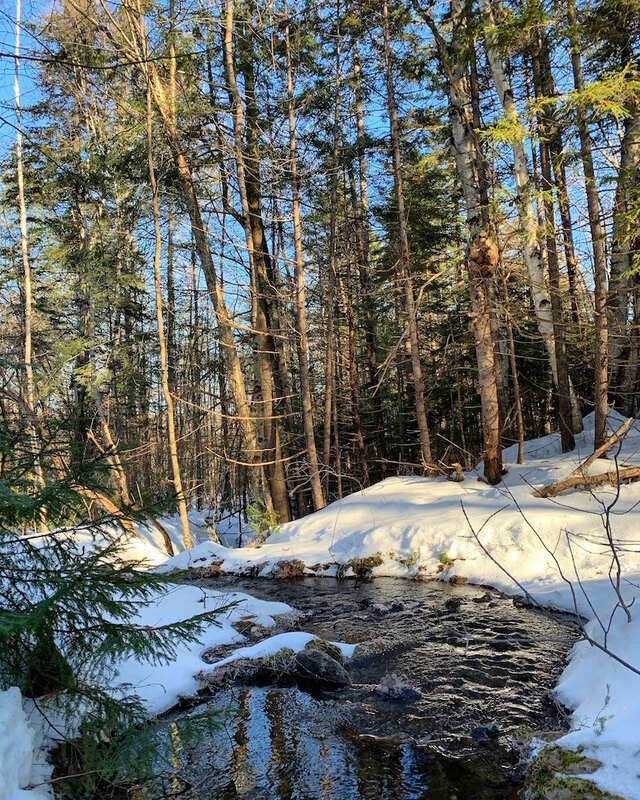 The fact that you have your own snowshoe trail makes me want to consider a future homestead! Enjoy the weekend! Catamount Solar got a lead because of the article you wrote! Thank you so much for supporting a local company! Brace yourself! More snow is headed your way shortly. You guys really don’t need more snow…. I love your updates, because you make me constantly reevaluate my desire for children. I’ve found a strange correlation between reading your posts and a dip in my desire for kiddos of my own. I think I might be happy being the cool aunt! Hehe. After enjoying the single life until 29 and never intending to raise kids, I married a guy who had 3 kids from a previous marriage. The two eldest were in college already, but my stepson (9 then, now 15) live with us full time. Although he is a good kid, can be quite entertaining at times, and has imparted me with immeasurable knowledge regarding cars, Minecraft, Pokemon, and The Avengers, helping raise a kid cemented my choice to not have my own kids. I wouldn’t trade my life at all and I’m grateful to be part of his life, but being the cool aunt is a great place to be and I’m thrilled I’ll be an empty-nester by 40. I just found your blog and am enjoying following along on your frugal homesteading adventure (and doing the Frugal Month challenge too)! It reminds me of a couple of books a college classmate of mine wrote about her outdoor and parenting adventures in a yurt in rural Alaska – A Long Trek Home and Small Feet, Big Land by Erin McKittrick. I think you’d enjoy those books! I read: “we generated 271 kWh” and immediately thought of Back to the Future 1.21 gigawats… Great Scott! Hi just looked at your Instagram account. Did I miss something or did you get a new dog? What’s the name if so? Thanks. Brrr… looks cold! I’m glad I live over on the west coast where we are enjoying a relatively warm winter. No snow here! In fact, I think we’ll be lucky to even see a dusting of snow this year. Global warming is certainly doing its thing here. Tako, you darn Jinxy! Record snow here in Oregon, power just came back on after 10 days, 6 hours. I have trees down everywhere. Your property is just stunning! I get to leave my little city life behind for the moments I’m reading through your blog. 😉 And I’ve probably learned more than I’ll ever need to know about cord wood, but you never know where life will take you. Great buy on the $1 snowshoes! Unlike Mr. Tako, this Pacific Northwesterner (is that what we’re called?) is hoping for snow! But only a teeny tiny bit with no ice. Glad you were able to have a mini sledding date! We’re trying to start a family, and I appreciate the honest look into what we’re getting ourselves into. I’m sure it will be chaos, but I’m sure (hoping at least!) that it will be lovely in its own way too. That is a lot of snow over there. Is it more than usual this time of year? Since we do not get snow here in the Bay Area, we had to make a 4 hour trek a week before Christmas to the snow and have our 2 year old experience his first time in the snow. We went sledding twice, made a snowman and he enjoyed all of it. He liked it so much that we’re planning on going back in February. Love seeing the baby snowshoes! I’ve been looking around for a cheap pair for our almost-3-year-old. She doesn’t always take to things so I don’t want to shell out for a new pair. But this year I got her training skates and took her ice skating for the first time ever last weekend. She loved it!!! The little training skates are so cute, two blades per foot. Her feet were flying on the ice and my husband and I got a good arm workout keeping her up (most of the time) on either side. Living in a climate where it never snows and never has, I love your pictures and reading about how much effort goes into life in Winter. It also makes me appreciate the reality is much different to the dreamy, romanticized notion of snow days that I have in my mind! The temp is going to be 42 degrees (C) here today so how about you send some cold my way and I’ll send some warmth yours? I got a chuckle out of trees failing on the trails. If you didn’t have the trails, you probably wouldn’t notice. Until we cleared out woods of invasive bush honeysuckle, it was a) difficult to see downed trees not on the trails and b) kinda scary to venture into areas off the trails. We have a designated burn area – located in a spot away from the house but not too far from a water source. We burn frequently, aka smaller piles. When we cleared the invasives, we only let the pile get so big before we burned. And the plus of cutting “standing dead” is it is ready to burn. We do have racks set up to hold split/to be split wood that won’t be ready until it seasons. Usually these are trees are “blow down” as you call them or ones my husband (safely – aka not close to structures) cuts down for our elderly neighbors. Love that you jumped on the sled! Last winter on vacation in New York state my husband and I saw so many good sledding hills. So we headed to goodwill to try to snag a sled. They didn’t have any, but we did snag some almost new J Crew Jean’s for my husband for $4, and paid full price for a sled at the sporting goods store next door. And got the baby snowshoes. That sounds amazing. To this Australian your winter sounds magic. I appreciate there is a lot of work but the joys are there. December here has been hot, thot, hot. Normally where I live we have really high temps and lots of humidity. Somehow we have avoided the very worst of it. We have not generated heaps of power from our solar panels. I hope the output will increase if we get some decent much needed rain to wash the dust away. It is small and lightweight but it is really effective, my husband often frees our paths from thinner trees or large branches with little effort. We even take it with us sometimes for horseback riding when some awkwardly fallen wood is obstructing a riding path. It beats schlepping around a motor saw, that’s for sure (also, for some reason the horses seem to take objection to motor saws 😉 ). Loving your winter adventures! Midway USA started with snow on October 19, and a blizzard at Thanksgiving. Old wise tale says, date of first snow is the number of snows you will have. We are at 7 of 19; this is not counting the 4 heavy rains we received before the snow. Rain prior to snow is unusual for our part of Kansas, full creeks, rivers and no drought( ooh). With all the weather, dh and I had minimal wood chopped….our son to the rescue. For Christmas ( we insist on consumable) he brought us a trailer load of logs!!. Now we did need to chop then split….which is where the issue occurred. I was running the splitter, dh was putting logs on and off. We were just about finished, when in a matter of seconds the splitter blade touch a log, the log flew out and up( think an arrow)…and bullseyed on the top of my boot. Major ouch! !, I can’t talk, dh is asking did you break your leg bone? I can only mutter, f…f…f.. he s thinking I m cussing( I don’t), when I trying to say foot foot, foot. Finally I get the foot word out, and said let s finish this job done. Foot area above the toes and 2 toes were swollen/ bruised once boot was removed…after 4 days of rest, ice, elevation…and little to no change…I went to the local chiropractor ( he s the best). He was certain, broken toes; fortunately ex ray did not slow any breaks! So, K tape, and elevation above the heart(oops missed that ), and a week later I can walk w/o pain, swelling gone. But we have a plenty of wood, I ve enjoyed the fireplace more than ever since I ve ne d to elevate the foot. And gotten several project completed- adorable double thick crochet chicken hot pads, some hand quilting, and a novel read! Every time you mention chainsaw safety I think of my husband, juggling one. My biggest issue with it is not the lack of safety, but that he forgets to turn his microphone off and then we have an amplified chainsaw motor blowing out our speakers. Ugh, doesn’t everyone hate it when that happens? 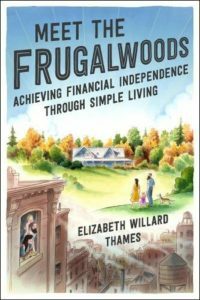 Just finishing up your book Ms. Frugalwoods, so thought I’d check out your blog. I’m very envious of your beautiful homestead but I know it must be a lot of work to maintain. I was born/raised/educated in Brooklyn and Cleveland and, although I’ve seen a lot of snow in my life, it pales in comparison to what you must contend with, all on your own. I’m sure if you want the snow cleared, you must do so yourself. Living in Texas now, I miss wood-burning fireplaces and snow-shoeing. Do you do any cross-country skiing up there, or is the terrain not conducive to that greatest of aerobic activities? How about using a wood chipper to make wood chips for mulch as opposed to a burn pile? Or just let the pile rot in the woods? Here’s to another enjoyable year of Frugalwoods adventure! The baby showshoes were cute! Your blog is so much fun to read! I am surprised you can put 1 1/2 cords of wood on your porch. As you undoubtedly know, a cord is 8x8x8′. Or did you mean a “face cord” which is 1/2 of a real cord. Oh my goodness, 3+ cords a year, I do not want to handle that much firewood. Here in upland NC we burn maybe a cord and a half, and that does our heat, cook top, oven and hot water for 4 (although some of us are small and need less water).